Yet another busy, but fun week! This past week our weather went from the 60's to record highs in the 80's and I believe even hit low 90's at a couple points, so Gary and I spent a good deal of time out in the garden. I will be doing a garden journal post hopefully later today or tomorrow. We got a lot done, and thank goodness, because the rain has returned and we are back down into the 60's for the week. We also had the fun this week of attending the local high school play- Neil Simon's Rumors- my son Joe was an assistant student director for this play, the play was hilarious and we had a ton of fun! Then this weekend we celebrated my hubby Gary's birthday and spent the day in town- Happy Birthday Gary! 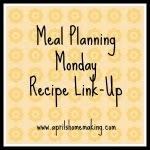 Now for Meal Planning Monday Recipe Link-Up! Despite all the busyness I did have a little fun in the kitchen- last week I experimented with my pasta alfredo recipe last time I did a Sausage, Mushroom, and Kale Alfredo and this time using the same recipe, but switching the sausage with crumbled cooked bacon, and instead of Kale using steamed green peas. This pasta dish was tasty, but I was not super happy with the peas, I think they may have been overcooked a bit because they were too starchy and with an already heavy dish (bacon and alfredo) it was too much. The fun thing is, you can really try this recipe with a combination of meats and veggies, I would love to try it with grilled chicken, and also with asparagus. So starting from the original recipe you can really experiment with many combos. I also had fun with tater tots, we were making a birthday breakfast for Gary, and realized we had no potatoes for hash browns. So I decided to fancy up some tater tots as a side dish to his omelet. I baked the tater tots until they were crispy and done, then topped them with sharp cheddar cheese and sliced green onions and put them back in the oven until the cheese was melted. They turned out yummy, not much of a recipe, but definitely a nice easy side dish for breakfast and I think it would also be a yummy side dish for dinners. Here's how they turned out. I am looking forward to seeing everyone's wonderful recipe posts this week, I love seeing everyone's creativity in the kitchen! Have a wonderful week!